Death in modern theatre investigates how dramatists and theatre-makers from the late nineteenth century to the present day have explored issues relating to death and dying in their work. Andrew Sofer’s The Stage Life of Props (University of Michigan Press, 2003). It models a form of theoretically-informed dramatic and theatrical analysis that I admire. Moreover, it’s beautifully written. Physical places, no. Emotional places, yes. My father died while I was writing the book, which made the process more difficult. I decided to acknowledge this reality in the book and make something of it. I brainstorm ideas and chapter outlines using Workflowy, a website/app that provides a simple but effective way to list things. If a stray thought comes into my head that I think might be useful, I add it to one of my lists. When it comes to actual writing I sidle up to a computer and get comfortable. The titles in MUP’s Theatre: Theory – Practice – Performance series are excellent. The prospect of having a book in this series appealed to me. Also, I had heard good things about the process of publishing with MUP, which, happily, turned out to be true. I’m working on several related research projects concerning the intersection of classical music and theatre. I’m interested in issues of representation, dramatization, and theatricality. Remember to think about the balance between unity and contrast (vis-à-vis content, tone, structure, etc.) across the whole book and not just in individual chapters. What kind of experience will the reader have from page to page and from chapter to chapter? Find a variety of rhythms and tones. Pale Fire. That Charles Kinbote fellow did a terrible injustice to John Shade’s poem. And Nabokov was a co-conspirator. Shocking. Plays (of course!). And short-form literary fiction. Anonymous has an impressively prolific and varied output. I would like to get to know her/him better. And Reviewer No. 2! Let’s see if they are as pithy in person. 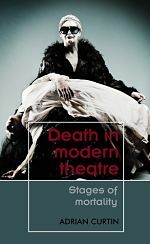 Death in modern theatre: Stages of mortality is available to buy now. Adrian Curtin is Senior Lecturer in Drama at the University of Exeter.